Now you can have a whole horde of zombies at your door or covered porch with The Zombie Horde! This Halloween haunted house ANIMATED GRAVEYARD ZOMBIE HORDE PROP TRIO horror decor Cemetery Scenery Set has it all! 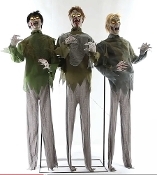 Three Six-Foot tall creepy Zombie characters have roto-PVC heads with light-up eyes, dirty fabric costumes with tattered shredded-gauze accents, posable arms with plastic ‘’blood-splattered’’ hands, and an easy-to-assemble frame. Plug in the UL power adapter into any standard outlet and choose from Steady-On, Infra-Red Sensor or STEP-HERE PAD (included) activation options to operate. Once activated, this scary Trio Zombie Horde will begin moaning and groaning eerily with spooky yellow glowing eyes. Each zombie sways individually from side to side, hungry for your brains! The infra-red sensor works from bright light to no light! Item includes volume control. Easy-to-assemble quick-connect poles for standing. Assembly required. *Suggestion: Fill out their clothing with empty plastic soda bottles, newspaper or crumpled grocery sacks to fill them out for a more realistic appearance.